Isn't this palette just beautiful?! I should have done the review of this baby a lot more earlier, but I just couldn't get around to do it. At first I wasn't sure about it, I wanted it really badly when it was sold out everywhere, but I manged to find last palette at my local Chanel counter. You can imagine how happy I was, such a luxurious gift from me to me. The five shades are absolutely stunning, amazing to create smokey eyes or natural everyday look. The pigmentation of all eyeshadows is great. The texture is very soft and smooth, the eyeshadows are easy to blend, the lasting power is very similar as the Urban Decay Naked palettes, in my opinion it's very good. The packaging is beautiful, I love the large mirror. I normally don't like the brushes which are included in the palettes, but these are really handy when you want to travel with the palette. You can create beautiful looks with this palette, I love applying the first shade all over the lid and then fourth shade in the crease. You can also apply the middle goldy shade all over the lid and then the forth shade in the crease, there are so many different ways you could apply the colours, everything is up to your own preferences. The price tag is so hefty, but definitely worth ever penny. 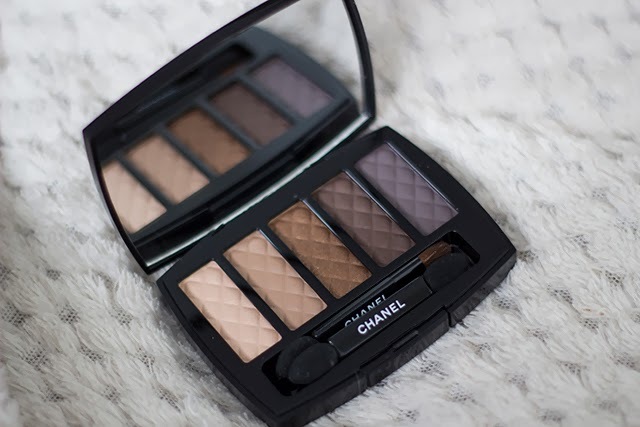 I read lots of negative opinions on the Chanel quads, so I was slightly worried that this palette will also have very weak pigmentation, but luckily it's amazing! Have any of you manged to get your paws on it? How do you like it? The last shade in the palette looks perfect, I love purple/grey toned colours! Such a gorgeous palette, if it wasn't for the YSL palette I picked up not so long ago I would have totally picked this little gem up! This is simply divine, such a beautiful palette. The colours are all so wearable too.